High Resolution: Yes; Widget Ready: Yes; Compatible Browsers: IE10, IE11, Firefox, Safari, Opera, Chrome; Compatible With: WPML, WooCommerce 3.1.x, Visual Composer 5.1.x; Software Version: WordPress 4.8.x; ThemeForest Files Included: PHP Files, CSS Files, JS Files; Columns: 4+; Documentation: Unrated; Layout: Responsive. Welcome to Tile Max theme, from Designthemes. Tile Max theme is an exclusive theme for floorings and tiles segments. Offering insightful pages and select Plugins for this niche, Tile Max theme is the perfect choice for your business of ceramic tiles, porcelain, marble and wooden flooring manufacturers and agencies trading in flooring and tiles materials. In addition, Tile Max theme is suitable for companies doing the renovation work and paving the floors apart from other flooring solutions and services. Let us look at Tile Max theme in more depth and examine the Plugins and frameworks it offers. Kirki: Tile Max theme lets you take advantage of its advanced features and flexibility. Tile Max theme comes with Kirki toolkit which is the ultimate toolkit for theme developers using the WordPress Customizer. Simply by abstracting the code, it is easy for everyone to design beautiful and meaningful User Interface, UI. Save Time: The ease with which you could add configurations for your projects is the most useful part of Kirki. In addition, it helps you save time which is great! Create you panels and sections. Customize and add fields with ease using Kirki toolkit. Unyson: Tile Max comes with Unyson, which is a free Plugin that is easy to configure. It offers the Drag and Drop framework coming as it does with a bundle of extensions which will work from the backend real fast and easy. Using Unyson, you can create backup and import demo content besides archiving the demo content for migration. You don't need separate slider Plugins as Unyson comes with 3 built-in sliders for images and video. Moreover, you can create amazing Mega Menu to display your menu configurations as a dropdown. In addition, using Unyson, you can create dynamic sidebars, filtering animations in portfolios, forms, breadcrumbs, SEO analysis, feedback and event management functions without opting for those Plugins! Google Maps: Using the responsive style Google maps, you can easily add responsive and styled maps. The plugin allows multiple markers on each map and multiple maps on each page. Google Maps comes with a shortcode builder together with 50 colorful map styles. The shortcode is very easy to generate and the map is very easy to use. In addition, you can easily edit a previously created shortcode! WP Store Locator is a powerful and easy to use location management system. You can customize the appearance of the map, and provide custom labels for entry fields. Users can filter the results by radius, and see driving directions to the nearby stores in the language that is set in the admin panel. Contact Form 7: Tile Max offers Contact Form 7 using which you can design as many forms with an unlimited number of input row fields in your form. You can design your own forms and limit spam and increase conversion. When you are running a site, there may be different requirements for forms to be configured from time to time. Contact Form 7 handles all. Designthemes Core Features Plugin: Tile Max comes with this Plugin. It is a simple WordPress Plugin designed to implement the core features of DesignThemes. Version 1.0 of this Plugin is integrated into the themes by DesignThemes. As a result, you can design the page layouts and configure the site easily with this Plugin. Envato Market: Tile Max comes with the Envato Market Plugin. Using the Envato Market plugin, you can easily install WordPress themes and Plugins purchased from ThemeForest & CodeCanyon. Simply connect the Envato Market API using a secure OAuth personal token. WordPress will periodically check for updates, once your themes & Plugins are installed. Therefore, when the theme that you bought earlier comes with an update, all you have to do is to simply click the update button on Envato Market and your themes and Plugins would be updated without any issues! Layer Slider: LayerSlider is a premium multi-purpose animation platform. Tile Max comes with the integration of this Plugin so that you can create amazing Sliders, image galleries, slideshows with mind-blowing effects, landing pages or even a full websites. Create gorgeously animated content in your site using Layer Slider. Slider Revolution: Tile Max offers Slider Revolution which is an innovative, responsive WordPress Slider Plugin that displays your content the beautiful way. Whether it's a Slider, Carousel, Hero Scene or even a whole Front Page, the visual, drag & drop editor will let you tell your own stories in no time! Build Modern & Mobile-Friendly Presentations. Creating content using these animated content creation tools, would ensure your site will have an edge over the other sites. It's easier than you think. Visual Composer: The Visual Composer makes designing of a site into a simple Drag and Drop affair that everyone would simply love to get their hands on. Using the WYSIWYG-what you see is what you get-interface, it is a piece of cake to design your website like a professional! Visual Composer Ultimate Addon: Includes Visual Composer premium addon elements like Icon boxes, model Popups, Info Box, Interactive Banner, Flip Box, Info List & Counter. Best of all ЁC provides A Font Icon Manager allowing users to upload/delete custom icon fonts. Parallax, Video Backgrounds, Row effects, CSS3 animations, icon fonts and much more! No coding needed: The drag and drop page builder makes everyone a designer without the coding know-how! The power of visual composer is integrated into Tile Max Theme. Create pages quickly with few clicks in few minutes with the help of Visual Composer and custom Tile Max shortcodes. WooCommerce: WooCommerce is a free eCommerce plugin that allows you to sell anything, beautifully. Built to integrate seamlessly with WordPress, WooCommerce is the world's favorite eCommerce solution that gives both store owners and developers complete control. The WooCommerce Plugin would enable you to sell online and receive payments in multiple currencies as soon as your site is configured! Image Regenerate & Select Crop: This Plugin appends two custom buttons that allows you to regenerate and crop the images. It also provides details about the image sizes registered in the application and the status of each image sizes for images. In addition, this Plugin also appends a sub-menu to "Settings" which allows you to configure the Plugin for global or particular post type of attached images. This Plugin also enables the developer mode for debugging if necessary. Akismet Antispam: Akismet anti-spam is used by millions as Akismet offers the best protection from spammers. Protect your blog from spam using Akismet which keeps your site protected even while you sleep! It is simple to get started with Akismet. Just activate the Akismet plugin and set up your API key in Akismet Settings. Simple, right? Shortcodes galore: Tile Max offers a plethora of shortcodes to configure your modules like tabs, accordions, buttons, and tooltips. The shortcodes offered in Tile Max is mind-boggling. Well, almost every conceivable need has been analyzed and these shortcodes have been included. All the requirements of your site for Blockquotes, Buttons & Lists, Carousel, Columns, Contact Info, Content Shortcodes, Custom Posts, Fancy Boxes, Icon Boxes, Image With Caption, Miscellaneous, Number Counter, Pricing Table, Progress Bar, Tabs & Toggles, Team, Testimonials, Carousel Testimonials, Timeline and Typography. Typography: With more than 600+ Google webfonts and the FontAwesome icons, you can set any color or size on your site and design your pages at will. You will become a professional designer by adding Google Fonts with typography field. In addition, you could add tooltips to help your users. Legendary Support: Using the extensive documentation, knowledge base and video tutorials you can get any clarification you may require about Tile Max theme, 24/7. Quick Shop | Multi - Purpose Sectioned Shopify Theme; Minimal Shop | WooCommerce Shop Theme; My Pen - Minimal Blog Theme; Asna | Personal Blog; Organic | Fruits & Organic Vegetables Shopify Theme; Baby Photography | Portrait Photography Theme; Begin Business | Startup Business Theme. Keywords: construction, flooring, maintenace, roofing, tiles. 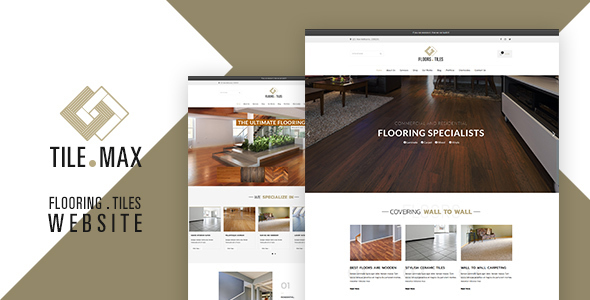 Premium ThemeForest Tile Max Flooring WP Theme 20890988 WordPress Themes, Website Templates, Mobile Themes, Flash Templates & Scripts from creative professional designers. Full details of ThemeForest Tile Max Flooring WP Theme 20890988 for digital design and education. ThemeForest Tile Max Flooring WP Theme 20890988 desigen style information or anything related.